If you are due to take a local flight – especially considering the renewed fears over the state of Nigerian aviation following last weekend’s Dana Air crash which claimed the lives of 153 from inside the plane alone, in Nigeria soon after your cinema outing, avoid seeing Last Flight to Abuja. However, if you are after a good Nigerian thriller this summer, or simply one to see the dizzying heights New Nollywood is taking off to, then Obi Emelonye’s Last Flight to Abuja is the must-see summer blockbuster. I met Obi only at the beginning of the year at the London press screening of Kunle Afolayan’s latest offering Phone Swap where the director of critically acclaimed The Mirror Boy, told me a little about his latest project, and considering the global success of The Mirror Boy, I wasn’t expecting anything less than superior. So I was excited when I got Obi’s invite to the world première of Last Flight to Abuja. The timing of the première was, for a discordant few ‘distasteful’, for the commonsensical majority ‘unfortunate’; however I applaud the cast and crew’s decision to go ahead with the première of a movie inspired by the horrific 2005-2006 period in the history of Nigerian Aviation plagued by three fatal crashes in one year and dedicate the film to the memory of last Sunday’s Dana Air crash victims. Inspired by true events, co-produced by The Nollywood Factory and Screen Nation Pictures, Last Flight to Abuja is a thriller about a set of everyday Nigerians who board the last Flamingo Airways flight scheduled to fly from Lagos to Abuja on a fateful Friday night in 2006. The plane cruises at 30,000 feet, tranquil and on schedule until all rapidly transcends into chaos on board through a mixture of human error, technical failure and sheer bad luck. As the pilots fight with the controls of the stricken airplane, a series of flashbacks unravel the twists, turns and leaps of fate that put each passenger on the fateful flight. Young lovers, an elderly couple, a corporate party, a sportsman on the threshold of greatness; all the passengers are caught up in the nightmare scenario and sense the final moments of their lives approach. 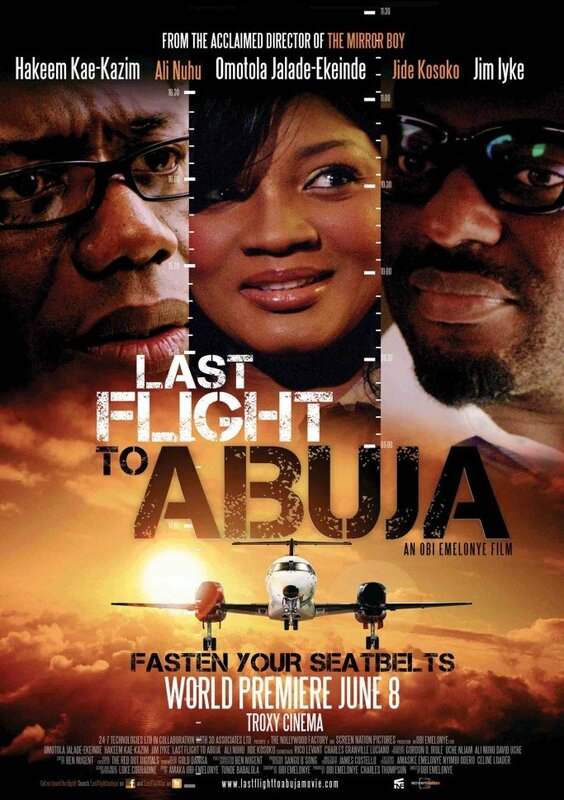 Will they survive…the Last Flight to Abuja? Perhaps last Sunday’s news is still too fresh, and scars for those effected too raw, but watching Last Flight to Abuja you can’t help but feel ever so conscious of the futility of our daily worries (like an errant fiancé, a blackmailing mistress or a clingy wife as is the case with some of the characters), the fearsome vulnerability of our mortal coil and the sheer disregard for it in cases where lack of care, finances, attention to detail take their toll. The cast does a brilliant job, with Omotola Jalade-Ekeinde as the wronged fiancée desperate to get back to Lagos after paying a surprise visit to her fiancé only to find a surprise, Hakeem Kae-Kazim as the shady businessman due to face the consequences of a moment of madness and Anthony Monjaro who cuts a fine figure as a experienced and dedicated pilot. The body count in the finale, however, not only fails to do justice to the tragedies of the 2005-2006 period where crashes claimed hundreds of victims, but also almost detracts from the catharsis we might have felt had the death toll been more realistic for a commercial airplane crash. In this case, we are made to almost say, “Oh okay then, it was not that bad.” Some may call my call for a higher body count morbid, but if I am sitting through a good hour and half of a film willingly suspending disbelief, the ending should make me feel it was worthwhile. The willing suspension of disbelief also cracks a little at the basic CGI deployed by Gold Danisa. Instead of the make-believe sky and the sun which then turns into a moon (of exactly the same shape and size and in the same position next to the control tower), I wish they had just concentrated more on inside the cockpit with more two shots and close ups of the pilots, brilliantly played by Anthony Monjaro and costar Celine Loader. As much as this is a disaster movie about an ill-fated flight which serves to remind us of how life can take a turn for the unexpected as a result of choices or circumstances which may look trivial at the time, there are moments that provide comic relief as well. Susie’s (Omotola Jalade-Ekeinde) sass in handling her fiancé, David’s (Jim Iyke) subtle small talk toasting Susie on board and the pièce de résistance which comes in the form of the flight crew striding towards check in at Murtala Muhammed 2 Airport in slow motion under the gaze of admirers and ‘haters’ (“I hate pilots,” says one of the passengers enviously eyeing them up while another one, a female, enthuses, “I love a man in a uniform!”). With all its twists and turns, moments of shock, gloom and hilarity, Last Flight to Abuja is a movie worth catching when it comes to a screen near you; just make sure you don’t have a flight to catch soon after. A very nice review. Thumbs up and keep it up. I like reviewers who doesn't focus only on the bad parts. And your criticism was constructive as well…wao!… Good job once again.